Hello all web users, as we all know the web and Internet has made our life so faster and so easier that some of us can’t live without it. Today a guy like you and me and lot more not just use internet for emails, news, sharing files but the new age is of Blogging, Social Networking, Tweeting and even Playing Games online. In this series Social networking with some famous websites like Facebook, Orkut, & Twitter have become a passion these days. 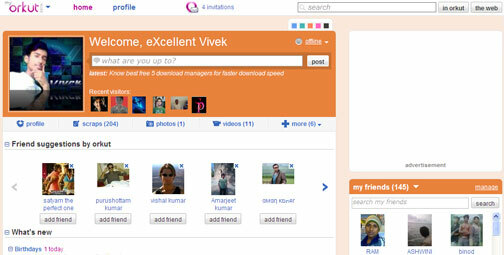 But here is the new news for Lovers of Orkut, the new ver of Orkut has been introduced by the Orkut Team. And what new stuffs & features does it have and how it is better and more convenient to use is the post all about. Finlay I will be reviewing this orkut and give you it’s look and also tell you how to get the new Orkut for you(Presently it is limited to certain users). Experiencing the new orkut was nothing but the fun in top gear. Yes the new orkut is very faster to load in browser due to Ajax(New and fast web framework). But one another thing that made my eyes opened, was it’s very calm and beautiful look. Now let me describe the new features it is carrying, The new orkut provide all stuff in less click/Pages with greater convenient. Now you can chat, watch videos, and browse and search within your full friends and communities lists without ever having to open a new page. It powers status updates like twitter on it’s home page. Over all I can say that this new ver. of Orkut will really provide you the great customization, faster browsing & clean & sweet interface. Join Poppy and Shashi on the official community (www.orkut.co.in/neworkut) for insights into the new version of orkut and participate in one of the many activities that will be taking place there. Be sure to check back often as the owners will be regularly announcing new ways to get access. Find a friend who’s already using the new version of orkut and ask for an invite. You can see who’s already gotten access via your activity stream or by this icon that will appear on your friends’ profile pages, next to their names. If you like what I write for you, You can comment here to say a hello or discuss this post. You can also read these posts by clicking RSS/Feed.